Perhaps you have not heard about the new update MCPE because the developers made a real mess. Over the past month, updates are coming out one by one because of which many players confuse the versions and play the obsolete ones. Let me remind you that the latest version of Minecraft PE is 1.1.0 which is in testing. If you are a lucky owner of an android device, then you can easily upgrade your game to 1.1, follow the link below. Speaking about the map, here you will see all the most significant features that are worthy of attention. 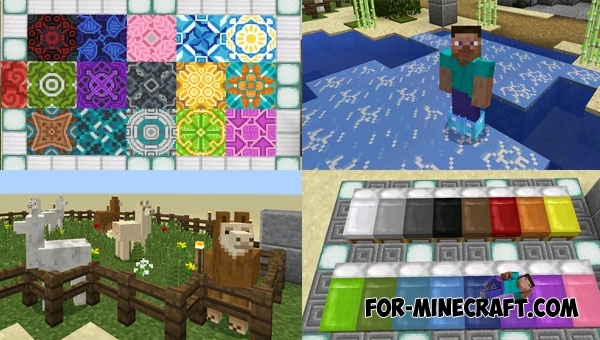 For example, there are pens with llamas, a platform with colored beds, all new blocks, a potion and items for two hands. If you do not want to read the list of changes then download this map and test everything yourself.